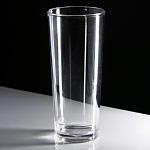 This glass has a certified line for all 3 sizes that are served thus minimising space required for storing multiple sized glasses. 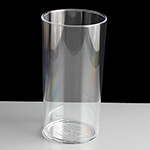 The polycarbonate plastic gives these plastic glasses a virtually unbreakable strength, so when it is dropped or trodden on it does not break. Polycarbonate is also suitable for up to 500 cycles before going cloudy in a dishwasher meaning it is just as convenient as normal glasses. The total capacity for these plastic wine glasses are 312ml to the rim, though the CE stamped line at 250ml is a comfortable measure of around a third of a standard 750ml bottle of wine. 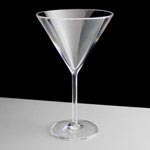 In addition to a large capacity, the glasses are great to drink from and ideal for a premium event experience with a heavy, sturdy feel which don't squeeze or move in the hand and a well finished, smooth lip to drink from. 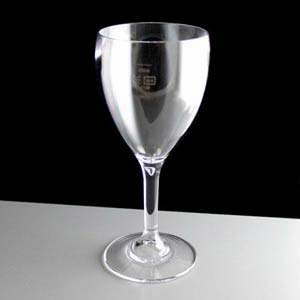 In addition to this glass, we also hold in stock two other varieties - BB143-1CL CE 250ml lined plastic wine glasses and the non stamped BB143-1CL NS non stamped plastic wine glasses.